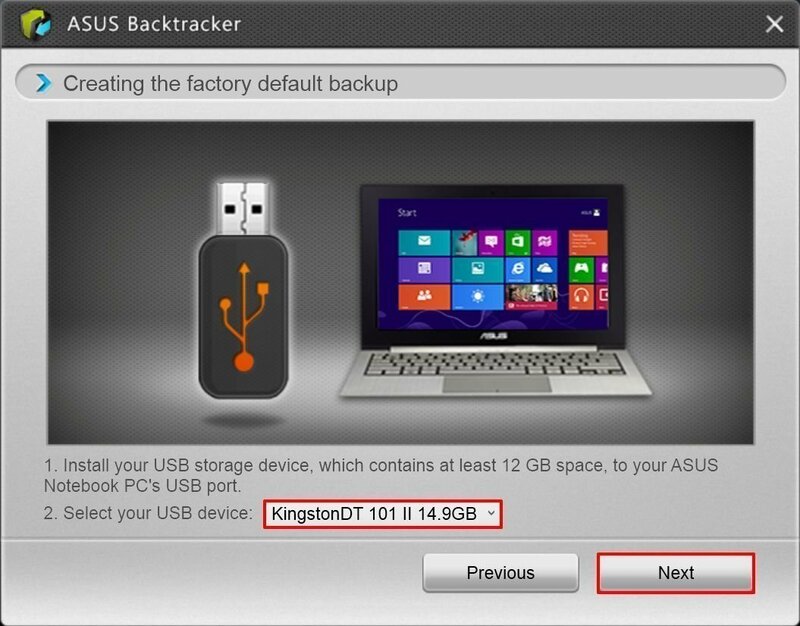 One click backup system using one key recovery backup feature in one click backup software, such as Lenovo OneKey Recovery, Asus Backtracker and AOMEI OneKey Recovery. For Lenovo users, you can do one click backup under the help of built-in Lenovo Onekey Recovery. Step1. Open Lenovo Onekey Recovery. Or, "Start"->"All programs" -> "Lenovo" -> "Lenovo OneKey Recovery" to open it. Or, just press Novo Button in Windows, usually on the upper left corner of the Top nearby the Power button, to enter it. If you have not power on the machine yet, you can directly get to Lenovo Onekey Recovery also by pressing Novo Button. Step2. Choose “System Backup” to do one key recovery backup. Step4.Confirm the one key backup and “Start Backup”. Wait until it finishes. First of all, prepare a USB flash drive no small than 16GB and plug it into your computer. 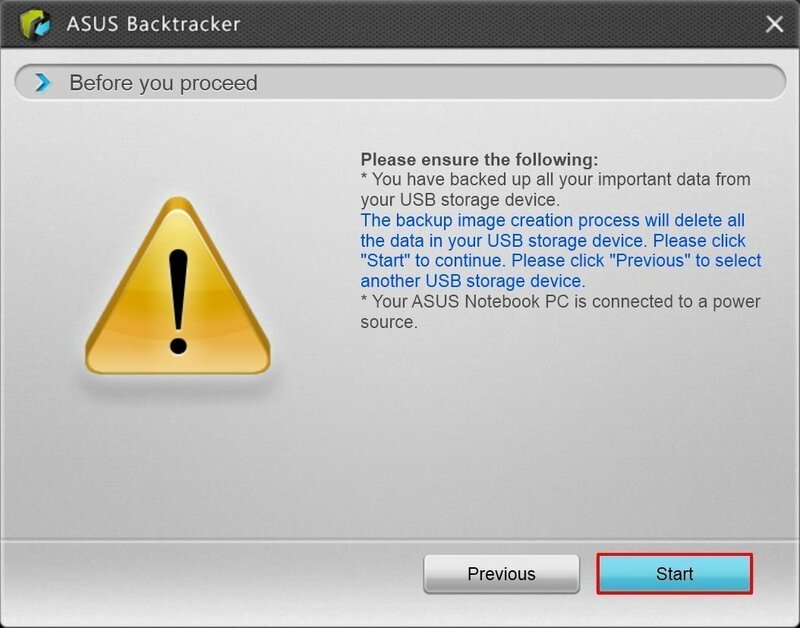 Then, download Backtracker and install it. Step1. 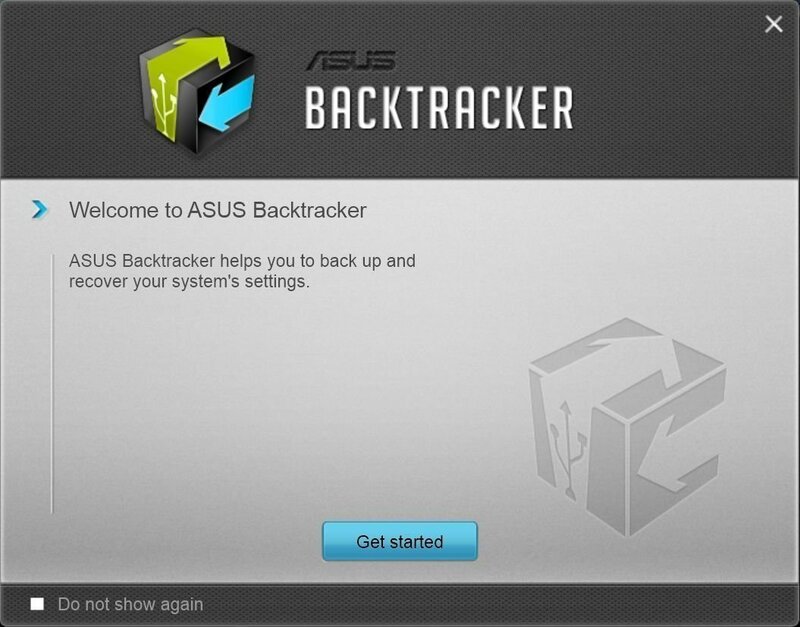 Open Backtracker and “Get Started”. Step2.Start back up the factory recovery image. Step3.Select your USB flash drive as destination to save system image files. Step4.Pay attention to the notices and start 1 click backup. Step5. Wait until it finishes and exit. 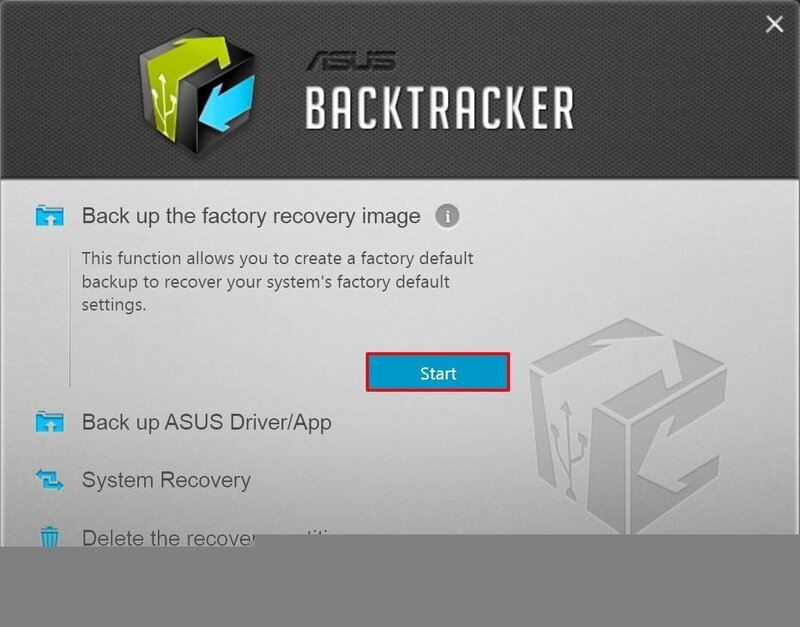 Just as said above, Lenovo users can make use of Lenovo OneKey Recovery and Asus users can rely to Asus Backtracker. And, for other brands’ computer users, most of them can seek help from machine snap-in one key backup function, like Dell, HP, Acer, Sony, Toshiba, Samsung, etc. However, the snap-in tool is limited to its own brand. For example, Lenovo OneKey Recovery can only be used on Lenovo products. If you do not belong to any of these brand; you do not know how to get use of its self-contained tool or the tool is unavailable due to some reason, or you just want to get a one click backup softwarewhich can be used on all brand computers, your best choice is AOMEI OneKey Recovery. 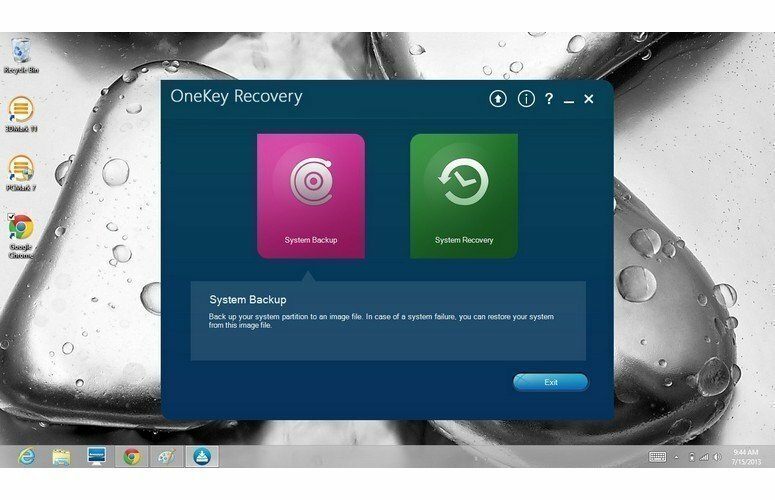 AOMEI OneKey Recovery is not a one click backup solution of a brand computer. It is a third party 1 click backup software. Before start, you should firstly download, install and launch it on your machine. Step1. In its main interface, select “OneKey System Backup”. Step2. 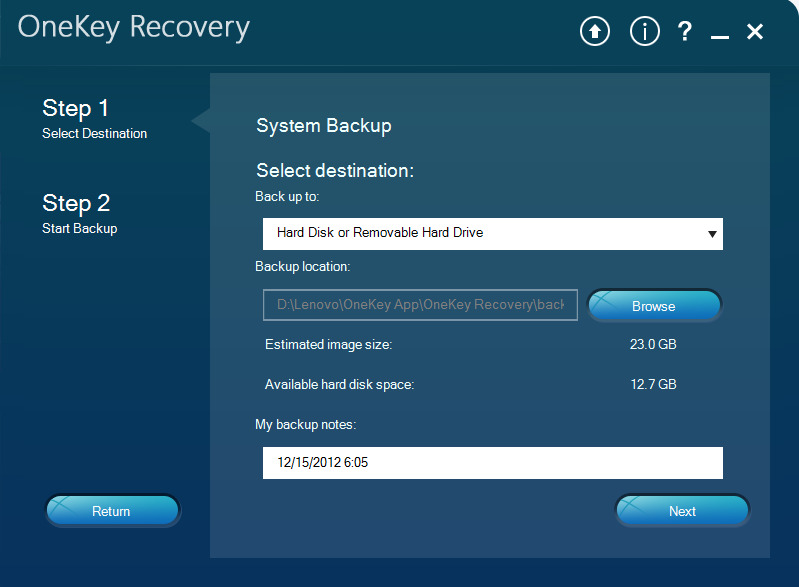 Select “Backup system to AOMEI OneKey Recovery Partition” (here) or “Backup system to other location”. Here, you can choose to compress or encrypt system image by clicking Backup Options on the bottom. Step3.If you choose the former in Step2, here, select a partition from system disk to create AOMEI OneKey Recovery Partition on. Tip: the greyed out partitions are unavailable for there is not enough space to make recovery partition. Step4. Click “Start Backup” and wait for it finishes. All three ways above can help you one key backup system easily. However, the first two is limited to its own brand computers while the last one is almighty. Besides this, AOMEI OneKey Recovery supports all PC computers including Windows 7, 8, 8.1 and 10, all editions, both 32 and 64 bit.